This product is very easy to use, not much security and doesn’t show historical results, the buttons can be pressed when in a bag by accident and this then wastes the battery life. Maybe a few cleaning wipes could be provided as well. Turns on even when accidentally pressed or put into a bag. A great thermometer. Easy to use. Can be used in the the ear and on the forehead. Good battery life. Accurate. Can be used by the whole family. Generally good, lasting product which is easy to use and provides accurate results quickly without having to pay a lot. It says it’s 2in1 but actually there is a mode for checking home temperatures (I have turned it on by accident and the home icon comes up but I really do not know how i did it). It’s very sensitive so it is important to remember to wipe it every time after use or the reading will not be accurate (even if just used in forehead mode). Overall, I am very happy we chose this one! Fast and accurate results, two ways of taking temperature. 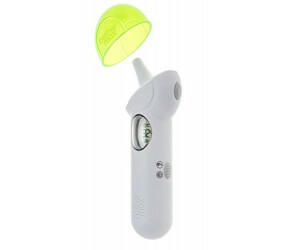 This thermometer has helped me on a number of times when my little boy was 11 weeks he became really ill and within a couple of hours his temperature raised above 40 degrees and kept going up, helped me keep track of his fever and strip him down to reduce fever. I had to call ambulance in the end but at least it helped me passed on the information to the paramedics. The only thing I don't like about it is that you can't mute the beeping sound, baby flinches with the beeping sound if asleep when I take his temperature. I have been using this since my son was newborn and cannot fault it! He had a tummy bug recently and I took him to the doctor as a precaution as I am a first time mum and the doctor had asked what temperature readings I was getting at home with this device and he commented how good my thermometer must be as he got the exact same reading with his one! For forehead or ear temperature readings in just 1 second, this 2-in-1 thermometer is accurate to 0.2°C. No need for probe covers; just wipe clean after each use. Suitable from birth, it’s ideal for the whole family. BPA and Mercury-free and as you’d expect from a certified medical device. It comes with 1 x 3V CR2032 battery ready for use. 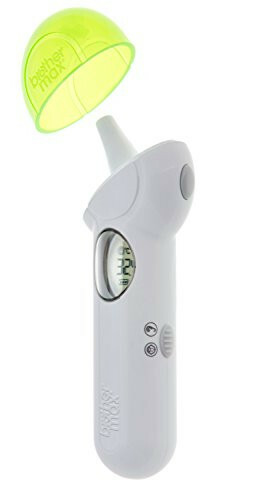 - For forehead & ear temperature readings. - Accurate to 0.2°C in just 1 second. - No need for probe covers; just wipe after each use. - Forehead scan-mode provides more accurate readings than ever. - Ear & forehead temperature readings in one touch. - Ideal for the whole family.